The central island of Paros - Πάρος, lying some 8 km west of Naxos, is occupied by a range of hills of gently rounded contours, rising to 764 m in Mount Profitis Ilias (rewarding climb, with guide; magnificent panoramic views). Three bays cut deep inland – in the west the sheltered Paroikia Bay, with the island’s capital that serves as the main sailing port and as a yacht charter base; in the north the bay which shelters the little town of Naoussa, which in Roman times was the island’s main port for the shipment of Lychnites marble; and in the east the flat Marmara bay. The whole island is covered with a layer of coarse-grained crystalline limestone, in which lie rich beds of pure marble. The island’s considerable prosperity has depended since ancient times on agriculture, favoured by fertile soil and an abundance of water, and on the working on marble, which is still quarried on a small scale. In recent years the rapid development of the tourist trade has brought changes in the landscape, the island’s economy and its social structure. Off the northern tip of Antiparos you can sail up close to two islets of volcanic origin, which guard the channel. Some 500 m south-west of Antiparos is the small island of Despotiko, with a sheltered harbour on the south. Still farther south-west is the islet of Strongoli, ‘the round one’. Excavations have yielded evidence of settlement in the Late Neolithic period (5th-4th millennium BCE). The island, which has preserved its ancient name, was already well populated in the age of the Cycladic culture (3rd millennium BCE). 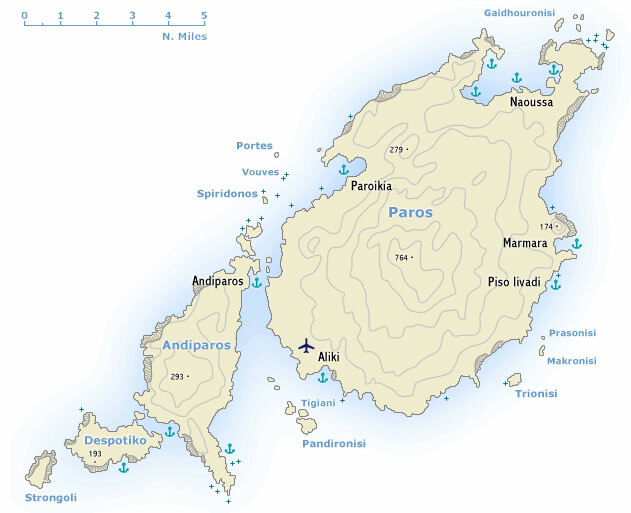 In the 1st millennium BCE the Ionian Greeks settled on Paros and made it a considerable sea-power, minting its own coins; in the 7th c. BCE Paros founded colonies on Thasos and in Thrace. In the 6th and 5th c. BCE Paros was celebrated for its school of sculptures. It was a member of the first Attic maritime league, and its unusually large contributions to the league (30 talents in 425 BCD) are evidence of the island’s wealth in the 5th c. BCE.